The cup is made by naturally and locally sourced clay by Jiri Duchek itself. It also contains a bit of locally sourced kaolin clay which is used for porcelain making. Additionally is glazed with a thin layer of white glaze. Such glaze is used in old times in Korea. You may check an aged cup from Korea on the following link. Tea drunk of such a cup has round, mild and pleasant taste, similar taste as achieved by pure porcelain cups. 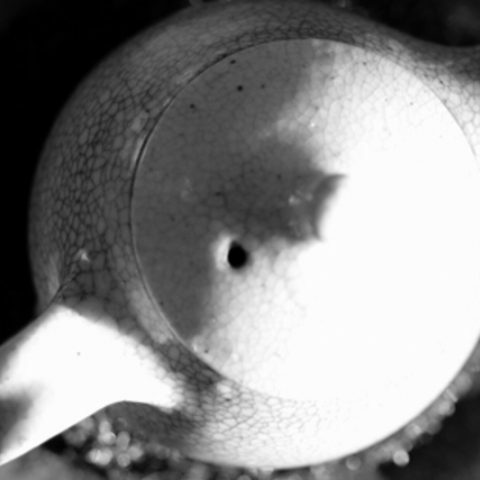 This type of glaze makes tea taste more neutral, clean and pleasant. It kinds of purifies the final taste of tea. The glazed fired shred will slowly age and change its color. A web of black cracks will appear and change the look of a pot. This web of cracks is unpredictable and could differ from a pot to a pot. Also the time when they appear is not fixed. 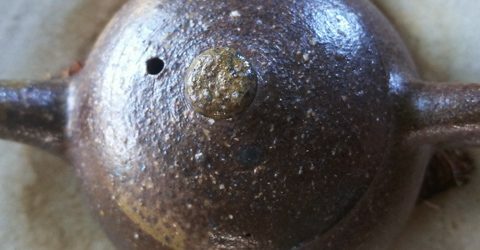 A picture of a last pot is a pot that was aged for two months. Some cracks will appear very fast but some only months later. 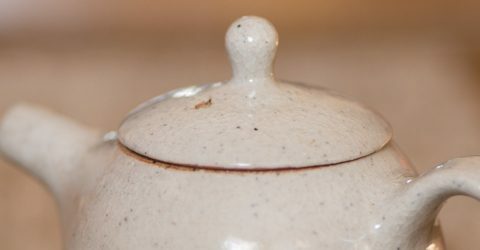 The lid of a pot is usually more slower in this progression of cracks. I its very interesting to watch a session to a session such changes taking place. It might one teach unpredictability of things that surrounds us. Each cup has an unique shape, size, fire marks. The cup surface is very smooth and nice to touch. The inside of the cup is glazed too and cracks will appear too. Special unusual #pinkypie “clouds” might be present. This marks are present from the start and I will be indicated if present on this pot or a cup. This colouring is very rare and praised as “probably one never knows why and when appear on ceramics”. This cup has not got #pinkypie spots. I know this clearly, this different feeling as I was taking other similar teapots with cracking glaze into my hands that were not used yet, they were 'sleepy' yet or I would say waiting to be disenchanted like in fairy tales.